Two of Australia’s tandem pairings celebrated riding into the Australian Long Team for the 2018 Gold Coast Commonwealth Games, while three Australian records were broken on day one of the 2018 Para-Cycling Track Nationals in Sydney on Friday 8 December. Hosted by Cycling NSW at Sydney’s 2000 Olympics Dunc Gray Velodrome, the first day of the annual championships featured individual time trials for all para categories including men’s and women’s tandems. The tandem titles and by virtue of their qualifying times – 2018 Commonwealth Games team Long Squad selection – went to South Australian rider Brad Henderson and his pilot Thomas Clarke, who covered the 1000 metres (four laps of the 250 metre velodrome) in 1.02.433. Henderson and Clarke had a smooth and powerful start out of the gate and were on schedule and well on their way to their gold medal by the halfway mark. They beat silver medallists Kieran Murphy (Lachlan Glasspool) by two seconds, with bronze medallists John Wood and pilot David Edwards taking bronze in 1.09.522. Having only had five months’ practice as a team, the winning pair were ecstatic with their result. In the women’s, Victoria’s Jessica Gallagher and pilot Lara Tucker (QLD) clocked 1min 8.924secs, under the Long Team qualification time and also good for the gold medal. The gold and qualification was a delight, especially as she had only been training with her new pilot, junior worlds medallist and daughter of renowned rider Kendrick Tucker, Lara Tucker, for a few weeks. The first women to medal at both summer (in track and field and cycling) and winter (downhill skiing) Olympics, the Melbourne rider had sought a new pilot via media release and selected the 18 year old Tucker. As a result, Queensland Academy of Sport athlete Tucker has moved from Queensland to Melbourne to train with Gallagher with the Commonwealth Games in mind. Her PB for the kilo (1000 metres) is 1.07.57 but with a different pilot, Maddison Janssen, with whom she took bronze at the 2016 World Championships. For Tucker, riding a tandem has been a whole new experience; one she describes as “different, but really good. You have to use your upper body more, as the tandem bike isn’t as flexible as your solo track bike and is longer,” she said. In other para events, three Australian records were broken, by Amanda Reid in the C2 women’s 500 metre individual time trial; Bronwyn Dolman in the C5 women’s 500 metre individual time trial and Gordon Allan in the C2 men’s 1000 metres time trial. Reid, 21, from Sydney, smashed her own previous national record on 42.147 in a dazzling 40.702, just 0.8 of a second outside the world record of 39.959. The Rio Paralympics and Italian World Championships silver medallist said her race had gone according to plan. “I think my starts have improved, probably from all the time I have spent in the gym and the training with Tom Dawson and Brad McGee,” she said. Her next goal is Sunday’s individual pursuit – “to make it to the end”. Interesting, of all the gold medallists on the day, she was the only one who said the time trial was her focus. From Nationals, she is hoping for selection for the world championships on a track she knows well – Rio – in March. Dolman, 35, from Adelaide, snagged her gold medal in 39.321, blowing apart the previous Australian Record of 42.62. The former tennis player took up para-cycling three years ago after the accident which led her to para-sport. “I am really happy, and I think it came from lots of work on my starts and a lot of mental toughness, but I am aiming for the individual pursuit on Sunday,” she said. “I don’t think it has sunk in yet.” She will contest the road nationals in January. For the third record breaker today, Gordon Allan, 18, of Sydney, his 1.14.932 kilo was a PB as well as a new Australian record, by 0.5. He attributed his success to the coaching of Tom Dawson and training six days a week on track, road and in the gym. Para C4 gold medallist Meg Lemon, 28, from South Australia, was pleased with her win in 42.740, but said she had seen the event as a hit out for the individual pursuit on Sunday. “I have been injured coming into it, so haven’t been able to ride big gears or high intensity,” she said. “I have had a knee injury for about three months after a crash, but hopefully I can do well in the IP.” The bronze medallist in the Worlds in the time trial, the former C3 classified rider took bronze in the IP and TT in LA after being reclassified prior to the Los Angeles Worlds this year. “I really want to thank my coach Loza Shaw from SASI and Cameron Jennings his assistant, as they are the reason we are on the bike and doing so well,” she said. Thompson said the IP was more his thing and that he was aiming for selection for the Paralympics. “I do road, but I am not great,” he said. C3 men’s ITT kilo gold medallist from Queensland, David Nicholas, 26, just edged out NSW rider Benjamin Swain with a 1.12.617 (1.13.296) to take the gold – but it was a couple of seconds off his PB. “I am actually better at the pursuit so am looking to the IP on Sunday,” he said. His goal is to do well enough for selection for the Australian team to the world championships in Rio, where he won IP gold at the Paralympics, following a previous gold medal on the road at the London Paralympics. C4 men’s ITT 1000 metre winner Kyle Bridgwood of Queensland finished just 0.7 outside the Australian record in 1.09.753, but the 28 year old from the Sunshine Coast was happy with his result. “I feel really good as I hadn’t been doing all that much,” he said. “Knowing I was that close is surely a good sign. I am more an IP-er, but what I really enjoyed was getting scratch race gold at the 2015 track worlds.” He also took two silver in Rio in the IP and road time trial. His goal is to make the team for a second Paralympics. C5 men’s 1000 metre time trial gold medallist Daniel Van Der Laan of NSW, said his ride in 1.10.126 was a step in the right direction personally. The Australian road time trial champion rode a textbook perfect 21, 15, 16, 18 race, but says he will be happiest when he can get back to his personal best of 1.08, achieved prior to the accident which led him to racing as para-cyclist. “I was hit by a car and have had a few operations, hip replacement, and so on,” he said. “My goal is to get to world level and see how I go. Longer term, Tokyo.” Meanwhile, he keeps busy with his own training and coaching some of the road guys on the Nero Racing Team. Day two of the 2018 Para-Cycling Track Nationals was an all tandem affair as the program turned to the sprints. With two riders driving the pedals, the speeds reached by the tandems can match those of the able bods over the flying 200m. Whilst conditions were not perfect for fast times, with a humidity of 57% and air pressure of 1020 making it a slog for the teams, competition amongst the women was hot. Jessica Gallagher (VIC) piloted by Lara Tucker (QLD) took the top ranking into the sprint rounds with a narrow 0.07 advantage over the South Australian pair of Rachel Henderson and Isabella Dashorst (pilot), with a time of 11.563secs. Evergreen ACT athlete Lindy Hou with pilot Kerry Knowler were in third, a second behind the top two teams. In the first race off, Henderson and Dashorst tried an attack at 400m from home, but could only get to the front wheel of the Gallagher/Tucker pair before they reacted and took them on in a drag race to home and were too strong, taking the first round easing off. Jessica Gallagher made it a clean sweep with a relatively easy margin in the second race. Starting in the second position, Gallagher & Tucker went to the lead at just over three laps to go. Despite several attempts by Henderson & Dashort they were unable to take the front position back, resulting in only one option, going full gas over the last two laps to try and prevail. They were unsuccessful, allowing Gallagher and Tucker to add to their time trial victory a day earlier. With an eye to the future, 14 year old SA rider Courtney Lewis with Pilot Elise Van Hoof was granted an opportunity to post a flying 200m time, albeit ineligible to due age restrictions for the Championships. With a 12.263secs, just 0.7 on the first placed team, the young lady looks to have a very bright future ahead, and might have a 2024 Paris Paralympic Games in the back of her mind. Only one men’s team took to the pine for the sprints, but South Australian Brad Henderson piloted by Thomas Clarke (SA) posted a strong 10.257secs at an average speed of a little over 70 km/h, just 0.4 seconds outside the national record taking them to a gold medal and National Title. With the Para TrackNats being held in conjunction with the NSW State Track Championships, Thomas Clarke took the opportunity to grab his own bike and give the flying 200 a crack. The rider, well-credentialed in his own right flew around the track in an even faster time than he posted as a pair, with a 10.12secs to wow the crowd as the fastest time on the track across all divisions on the day. The final day of the Para-cycling Track National Championships saw some new rivalries develop and strong performances as the riders spent all of their energy reserves on the track to record some blistering fast times including three new Australian records. Held in conjunction with the NSW Under-19 and Elite Championships, Sunday was Individual Pursuit day at the Dunc Gray Velodrome with the Paras up first. In the C4 Women’s qualifiers, Meg Lemon (Port Adelaide) was looking to be on Australian record pace, before slowing to concede the top qualifying spot to Emily Petricola of St Kilda. 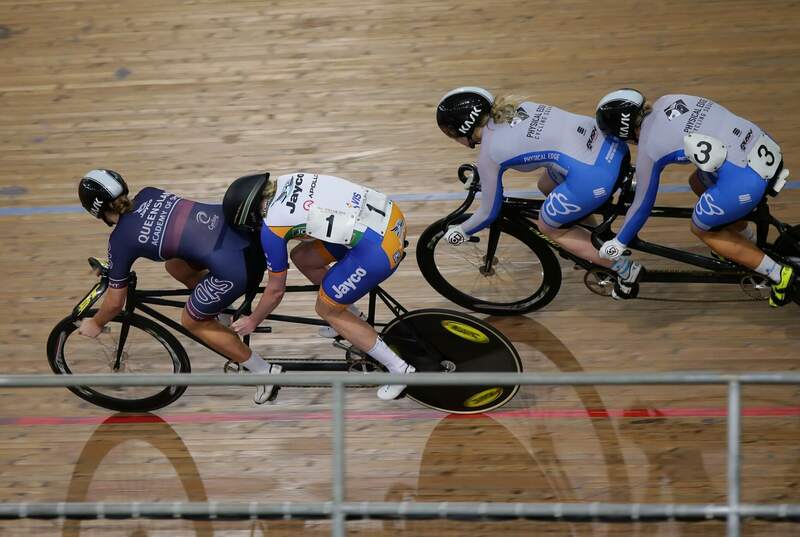 Despite trailing for most of the race, Emily was able to claw the deficit back in the final 125m, pipping TT Champion Meg by 0.23s to securing the Championship and a gold medal to add to Friday’s silver. Parramatta’s Simone Kennedy produced a dominating performance near her Australia Record to win the national title over Paige Greco who is new to the C3 Women’s classification. Darren Hicks (Kilkenny), who was previously defeated by up-and-comer Gordon Allan during Friday’s TT, was not only able to secure the IP win over Allan, but broke Allan’s provisional Australian record in their ride-off by over three seconds. Townville’s Kyle Bridgwood was the stand-out C4 Men, managing to lap his opponent Patrick Best twice on his way to his second gold medal of the meet. Riding solely against the clock, SA’s Darcy Thompson recorded the first C1 Men’s IP time to set the new Australian record. Canberra’s Lindy Hou and pilot Kerry Knowler were the only tandem women starting on Sunday making the pair the only riders competing across all three days. The long-time pairing was able to record a strong time of 4mins 3.820secs to claim the national title. While not contesting in the same category, eyes were on both local Amanda Reid, the current Australian record holder in the C2 Women, and C5 Woman Bronwyn Dolman of Port Adelaide after both riders broke Australian records in the time trial to take the lead in the Australian Champions Jersey competition. Both riders went on to ride strongly however it was the time trial count back that awarded Bronwyn the Australian Champions Jersey. The ride of the day quite possibly came from Queensland’s David Nicholas who qualified into the C3 Men’s final with Hunter’s Benjamin Swain. David, in his current World Champion jersey, rode a dominating performance to catch Ben in just four laps and continue on to break his own Australian record time. In doing so, David secured a bonus title, the Australian Champions Jersey, as a shared honour with Bronwyn Dolman.